A light beer, top-fermented, inspired by the Belgian Beers Pale Ale. The special feature of this product is the addition to the traditional recipe, the Genepì Artemisia 100% Aosta Valley during the fermentation process. The use of herbs is inextricably linked to the history of beer. If today the bittering and aromatic ingrediënt in most beers in the world is hops, in the past it was not so. Already in the ninth century A.D. it mentioned the Gruit; a mixture containing herbs and spices. The idea is to produce the highest quality beer using seasonal raw materials of our territory. 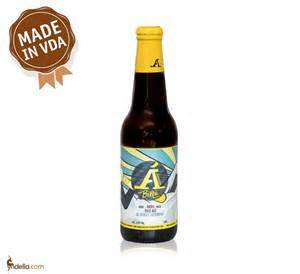 A beer with a smooth and round taste given by the honeyed taste of malt, from the bouquet of aromas created by the yeast and characterized by the aroma of Artemisia Genepì. These sensations are distinguished gently in the nose while on the palate harmonized without being too pushy.